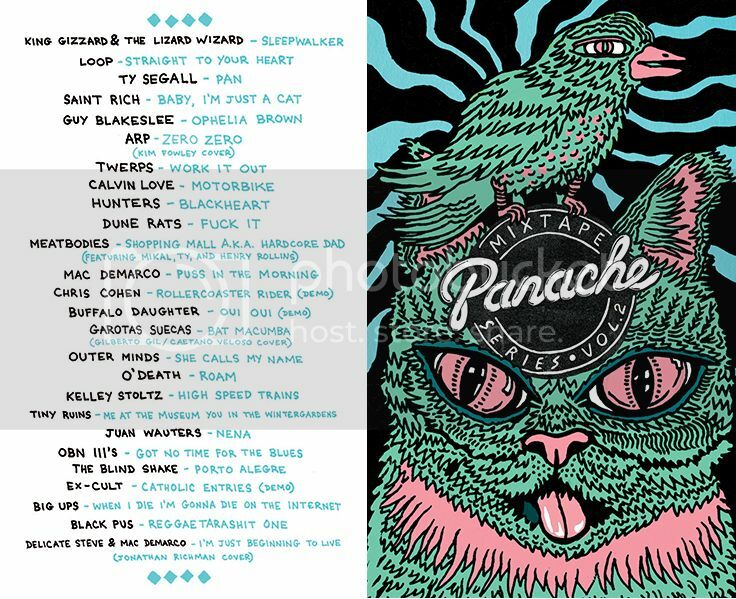 Panache announces Cassette Mixtape Series Volume 2 featuring unreleased tracks from Ty Segall, Mac DeMarco, Delicate Steve, Saint Rich, Black Pus, Guy Blakeslee, Ex-Cult & more! Panache is thrilled to announce our second official cassette mixtape available now!!! Volume 2 features mostly unreleased tracks from over 25 Panache artists including Mac DeMarco, Ty Segall, Loop, Delicate Steve, Saint Rich, Juan Wauters, Black Pus, Guy Blakeslee, Chris Cohen, Kelley Stoltz & more! Limited run, only 650 in total. One time only pressing!! Only 100 for sale online! Will sell out! $7 + $2.50 Shipping — Purchase Below — PLEASE NOTE THESE WILL NOT BE SHIPPED UNTIL THE WEEK OF MARCH 17TH. Domestic shipping only. No international orders, please. The remaining tapes will be available at our SXSW events, our official showcase info is here.